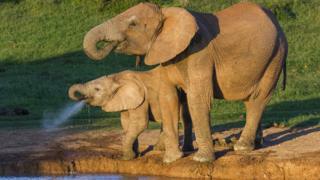 Elephants have enhanced defences against cancer that can prevent tumours forming, say scientists. They were trying to explain why the animals have lower levels of cancer than would be expected by their size. The team at the University of Utah said "nature has already figured out how to prevent cancer" and plan to devise new treatments. But experts said the focus should be on the "ridiculous" and "absurd" things humans do to increase risk. There is a train of thought that says every cell can become cancerous so the more of them you have, the more likely you are to get cancer. So if an elephant has 100 times as many cells as a person then the trunk-swinging mammals should be 100 times more likely to have the disease. And yet the analysis, published in the Journal of the American Medical Association, showed only 5% of elephants die from cancer compared to up to 25% of people. The scientists turned to the elephant's DNA - the blueprint of life - to find an explanation. But animals also have "smoke alarms" that detect the damage and either lead to the cell being repaired or killed. One of these alarms is called TP53, and while humans have one TP53 gene, elephants have 20. As a result, elephants seem far more keen to kill off cells on the cusp of going rogue. Dr Joshua Schiffman, one of the researchers and a paediatric oncologist, said: "By all logical reasoning, elephants should be developing a tremendous amount of cancer, and in fact, should be extinct by now due to such a high risk for cancer. "Nature has already figured out how to prevent cancer, it's up to us to learn how different animals tackle the problem so we can adapt those strategies to prevent cancer in people." Animals have evolved different ways of tackling cancer including the naked mole rat, which is also incredibly cancer-resistant. But Prof Mel Greaves, from the Institute of Cancer Research in London, says we should focus on why humans have such high levels of cancer. He told the BBC News website: "In terms of adaptive mechanisms against cancer we have the same as a chimp, but we get a lot more cancer than a chimp. "I think the answer is humans are completely unique as a species in having very rapid social evolution in a short period of time." He pointed to the rise of unhealthy, cancer-causing behaviours, such as obesity and sunbathing. "You've never seen an elephant smoke!" he added. The menopause is also a potential explanation for why humans have not evolved better ways of preventing cancer. In an evolutionary sense "success" is judged by the number of descendants you have rather than how long you live. Elephants have the greatest reproductive success towards the end of their lives, while humans can live for decades after the menopause. It means there is little evolutionary pressure in humans to develop ways of preventing cancer in old age. "Humans have engineered socially extended lifespans way beyond reproductive senescence - you can't find another species like that," concluded Prof Greaves.